Annabelle Broom (Emily Jo Seminoff-Shepherd) is a non-conformist witch who would rather help than hinder; rather be chic than shock. She ends up clashing with her tough witch superiors (Kerry Brown, Marcia Gollober, Barrett Shepherd, and Rebecca Greb) over her unconventional beliefs and nearly loses her haunting card when she decides to help instead of frightening two lost children (Lenea Christianson and Kate Loscutoff). Bucking tradition is always tough, but when you’re a witch and it’s the scaring season, things get even more complicated. Annabelle Broom finds herself in this exact pickle when her heartstrings are tugged by two lost kids in need of a grownup’s assistance. But, as she’s already at odds with her pointy-hatted superiors, Annabelle could lose her haunting card if she doesn’t frighten the youngsters. Placing its protagonist at a crossroads, Eleanor and Ray Harder’s enchanting children’s musical explores what happens when doing your job means ignoring your conscience. 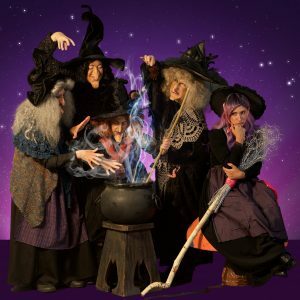 With its delightful charm, gentle wit and winning sense of humor, “Annabelle Broom, the Unhappy Witch” is fun for the whole family. 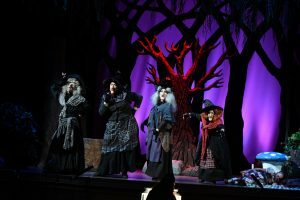 The show is directed and choreographed by Staci Arriaga, with music direction by Lori Jarvey, set and light design by Craig Vincent and costume design by Denise Miles. Recommended for audiences ages 4 and up. Reserved seats are adults $16, Senior 62+ $14, children 17 and under $8. Reserved balcony seats are $10.